Have you ever wondered how to sketch trees? Sketching trees is not difficult at all, but you need to learn a few basic techniques to do it right. Because trees form one of the most important elements in landscape painting, you should spend some time stuyding them. 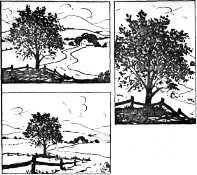 While it is not necessary for you to be able to identify every tree by name, you should become thoroughly familiar with their characteristics before you can sketch trees effectively. Their anatomy can be more thoroughly studied in the late autumn or winter when they are bare of leaves. 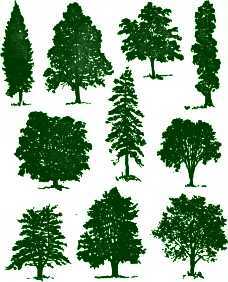 A typical example is the difference in the trunks of trees. Generally a fast-growing tree is much straighter than a slow-growing one. Notice how the branches leave the trunk, so that you will have some knowledge of what is taking place when you paint the tree in full leaf at a later date. Part of the "how to sketch trees" process involves taking notes when the trees are bare. That will help you understand how the masses or clusters of green leaves are formed by the under-structure. This is another useful tip on how to sketch trees: When drawing or painting the foliage of the tree, look for the large masses first. Try to see the entire tree as broadly as possible. After indicating the largest masses, look for the secondary forms within these masses. Disregard the leaves. Squint your eyes so that you see only the general masses. Keep the mass effect in mind at all times when you are painting in color. Choose a time of day when the light and shade areas are clearly visible, to help you to define the big shapes. When sketching trees, avoid the obvious green used by inexperienced painters. Study the clusters of trees before you, noticing how some are more bluish than others. Observe that what at first seemed to be a definite green in a neighboring tree really has a yellowish cast, while another may run to more brown. Exaggerate these colors when you apply them to the canvas, and it is surprising how readily your eye will accept them as an interesting group of trees. Your first efforts may contain some raw color but you will soon learn to modify it. By using this approach in sketching trees you will avoid the deadly monotony of obvious green. Study a branch in your studio. Take special note of the angles of how the smaller branches leave the larger one. Note the gradual tapering toward the ends of the twigs. To sketch a tree, add a decorative note to the subject by composing a painting so that the trees form a frame. The spots of sky that are seen breaking through a tree are often painted too light. When we look at these spots and see them enveloped by dark green leaves the contrastoften exaggerates the light that penetrates. In order to keep these spots from "jumping out" of the tree, paint them in a slightly lower key than the rest of the sky. The smaller the spot, the lower the key. 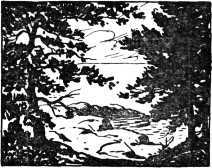 When sketching a group of trees, look for a light tree against a darker tree to add variety to the scene. You will find it helpful to draw a tree as it grows, from the base upward, from trunk to branch to twig. The area that it is to occupy can be lightly indicated, but when doing the actual drawing start at the base working upward and outward to the tips. Try to convey the feeling that the base of your tree is really growing out of the ground, with its roots gripping the earth. Many beginners paint their trees as if they were upright logs, cut sharply and flush with the ground. Avoid painting a clear, definite line where the tree meets the grass; soften the edge instead. Notice how the grass is reflected upon the tree trunk and paint some of this greeninto the trunk. An excellent "how to sketch trees" exercise is to make as many compositions as possible using the same tree as a motif. You will learn how a tree can be a complete composition in itself, how the tree can influence the foreground, how it can become asubordinate element in a vista, how it can guide the eye to the middle ground or the distance. All of these points are essential when learning how to sketch trees. Mistakes are frequently made in drawing the branches emerging from the main limbs. Remember that the branches grow in different directions from the limbs. 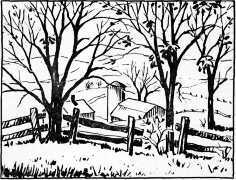 Simplify the modeling of the trees as they recede by limiting the tonal range. Watch the edges of your foliage; a sharply defined edge comes forward and a soft edge recedes. While the silhouette reveals the identity of the tree, keep in mind the importance of its depth. Take pains to depict the clustered areas of leaves that come toward you as well as those that recede. Done with How to Sketch Trees? Go Back to Outdoor Sketching.